Whether you love birds, French food, Julia Child or all three, this charming birdhouse is sure to have your mouth watering. 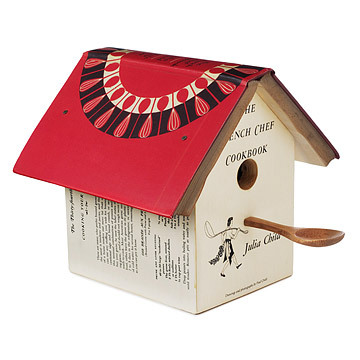 Handmade from a vintage French Chef Cookbook by Julia Child, this ornamental birdhouse is covered by the title page, two recipe pages, and a picture of Julia and features the rest of the book as a roof. The finishing touch? A perch made out of a mini wooden mixing spoon. Handmade by Dave Vissat in Pennsylvania. Artist Dave Vissat spends his days as a creative director for a Pittsburgh advertising agency. But for the last ten years, he has spent his nights creating one-of-a-kind birdhouses out of vintage books. Vissat stumbled upon this idea when he was making a birdhouse for his mother. He ran out of wood, so he resorted to using an old book as a roof. Then he began incorporating interesting text and illustrations as well. Now, Vissat searches and scavenges flea markets and libraries for discarded and vintage books, then he scans the cover, makes a print and affixes it to the exterior of the house. Julia Child Cookbook Birdhouse has been discontinued. When it sells out, it will no longer be available. A beautiful, original and well made birdhouse. Almost too nice to put outside. My neighbor proudly displays her gift in her home. "Perched" on the shelf of my stove hood, this adorable decoration has received many comments. Most people ask if I made it (I tell the truth). Julia's actual cookbooks adorn my kitchen shelves, so this birdhouse is most appropriate. Gave as a gift to my mother. Beautiful and one of a kind. Such a great idea! Very well put together, made from an actual Julia Childs book! An excellent gift for someone who loves to cook.